SANSEAM® EPOXY-QUARTZ FLOORING is a companion product of POXEPLATE®. It has been specifically designed for use in Industrial, Commercial, and Institutional applications where a decorative floor surface is required, while at the same time, containing all of the abrasion and chemical resistant qualities characteristic of POXEPLATE® EPOXY FLOORS. It is composed of a two component, 100% Solids Epoxy containing no solvents, formulated with decorative quartz aggregate to form a workable matrix that is applied over a concrete or wood floor in thicknesses of 1/8" to 1/4" and trowelled or broadcasted to a smooth or slipproof surface. SANSEAM® can be used wherever the existing floor is in a worn and deteriorated condition or where a decorative floor surface is required in offices, cafeterias, washrooms, laboratories, and other plant or institutional locations. All surface, base, and application procedures are identical to those outlined for POXEPLATE® EPOXY FLOORS with the exception that the standard SANSEAM® EPOXY-QUARTZ FLOOR installation may be more commonly applied at the 1/8" thickness since usually only foot traffic and light duty activity is anticipated in locations where decorative floors are used. The surface sealer and coating may be Polyurethane instead of Epoxy, and the finished texture may be either smooth, semi-smooth, or slip proof. SANSEAM® EPOXY-QUARTZ FLOORS are available in 11 basic colors consisting of Green, Blue, Red, Grey, Buff, Brown, Caymen Green, Plum, Black, Tan and White. Other special colors orders are available. The colors can be custom designed, mixed, and blended to provide hundreds of color variations achieving a "salt and pepper" effect. The outstanding feature of SANSEAM® is that it is possible to achieve a more decorative floor surface that is highly resistant to heavy abrasive activity and chemical spillage in the normal plant situation. 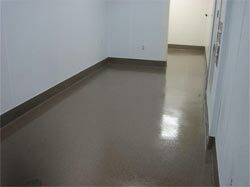 SANSEAM® Floors are completely seamless, sanitary, easy-to-clean, and maintain a permanent gloss. Installation requirements eliminate dust, noise, and costly "down-time." Large areas consisting of several thousand feet can be completed, cured, and returned to use during regular working hours or on weekends, nights, and other off-hour periods. Most major installations can be, and usually are, performed during weekends with complete installation and cure accomplished within this period. The floor area would be ready for full use on Monday morning.